Des Cason is an extraordinary man who, a la Herb Hilgenberg of Atlantic crossings fame, has made it his voluntary task to act as weather router for all who wish to use his services to get weather for the Indian Ocean and rounding the Cape of Good Hope – neither of them comfortable easy passages! Free of charge, he gives invaluable weather advice and routing. The Ocean is a much safer place for his knowledge, time and gracious help! Des and Nell Cason of s/v 'Gambit' are happy to offer advice to cruisers visiting Madagascar and South Africa. They have sailed this area extensively and welcome the opportunity to stay involved in the well being of fellow sailors. Contact via email at sygambit@gmail.com. 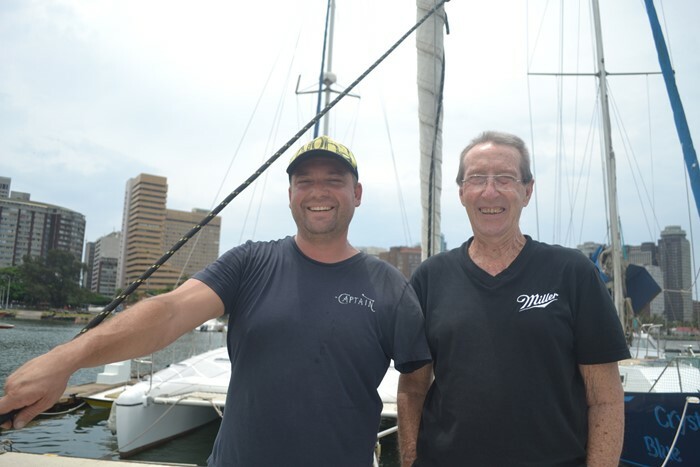 Photo of the OCC Seamanship Award winner Dustin Reynolds and Des Cason (right).